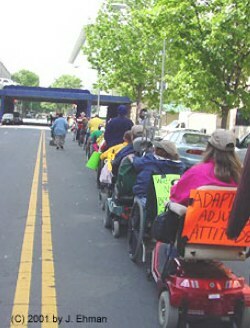 The ADAPT troops march to Hud's office. The demand: Sec. Mel Martinez to enforce section 504 in all HUD housing and end loans to nursing homes. As ADAPT stormed HUD headquarters, a few ADAPT troops, for the first time in ADAPT's history, pushed through security and police making their way inside the building. ADAPTers blocked all the door ways - converting HUD into a nursing home.